Now is the time to start planning your entry garden. This welcoming patch has the power to set a warm and friendly tone for those who pass through your garden on the way to your front door. It does take some planning to set the proper mood, however, and you need to consider architecture, setting, scale, boundaries and maintenance. 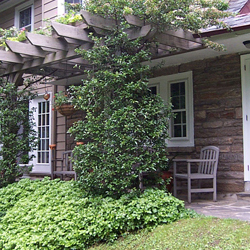 First, it is critical that your garden style suits your architecture and setting to create a cohesive, uniform look. Try to match the hardscaping and plants to the style and feel of your house. A cottage or farmhouse would be accentuated by a friendly, loose informal garden with plants spilling onto the walkway and colors blending together at the edges of beds. A more formal and symmetrical building, however, should be paired with a more structured garden that includes well-groomed shrubbery, stately flowers and a well-defined path. Pay attention to the scale of the plants you choose. Plants that will grow too tall or broad can overwhelm the house or crowd the walkway. Plants that are too small can make the house feel too large and unwelcoming. 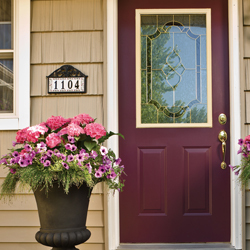 Investigate the mature sizes of plants and be sure they are positioned appropriately within your entry garden so they will not crowd one another or block key features of your home, such as house numbers or security lighting. Consider setting boundaries for the garden using a fence, wall, hedge or gate. The boundary could encompass just the area around the front door, might include a flowerbed border or could frame the whole yard, but keep in mind the size and style of your home. A white picket fence around the entire yard is a quaint option for a cottage-esque home, but would look out of place with an elegant brick manor, which would be more suited to a wrought iron boundary or classic boxwood hedges. Be realistic about the amount of time you have to maintain your entry garden. If you have limited time, choose native or easy to care for plants that will require little attention. Also consider using containers for some of the plants. They can be easily rearranged throughout the seasons to give a different look to the garden, and plants can be brought in over the winter months. Keep in mind essential tasks such as weeding, pruning and watering, and plan the garden to suit your abilities, time and budget so you can always keep it in perfect condition to welcome visitors. 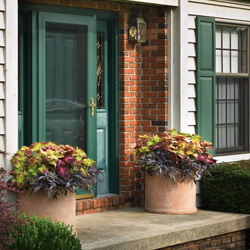 With a little planning, you can create a welcoming entry garden to beautifully greet guests as they visit your home. This entry was posted in Early Spring, In The Nursery on January 5, 2017 by admin.